The Pacific white-sided dolphin is a very active dolphin found in the cool to temperate waters of the North Pacific Ocean near the Central Coast of California. 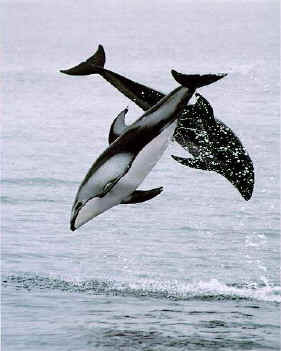 The Pacific white-sided dolphin has three colors. The chin, throat and belly are creamy white. The beak, flippers, back, and dorsal fin are a dark gray. There are light gray patches on the sides and a further light gray stripe running from above the eye to below the dorsal fin where it thickens along the tail stock. A dark gray ring surrounds the eyes.